If you’re looking for the very best in Family Entertainment, look no further. 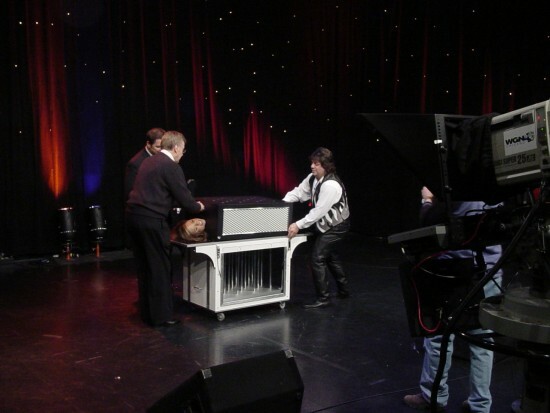 Magician Steve Chezaday has been performing professionally in Naperville and the suburbs of Chicago for over 25 years! From Strolling Magic to Grand Illusion, each performance features audience participation and is designed to meet your entertainment needs. With our flexible set-up and pricing options, we have the knowledge and experience to make your event a success. We are a fully insured traveling show that can provide our own professional sound, backdrops and lighting equipment if required. Experience for yourself the best-kept secret in Family Entertainment .. Chezaday! Steve came recommended to us from a friend in another Cub Scout Pack and from the moment I contacted him, I knew we were working with a true professional and were in for a terriffic show. Steve was in great communication with me through the whole process. He outlined what the show would include and reviewed the grand illusion he would perform. His show was wonderful! Steve pulled the kids all up front so they could see everything close up. My wife sat up front with the kids and said she never saw so many amazed and smiling faces! The kids were so into the show and Steve did a great job involving them as well as interjecting enough humor for the adults to enjoy! Everything Steve did was professional from working with him on his easy to understand contract and from being right on time for his set up and performance. After the show, he took time out to sign autographs for every child and believe me, they all wanted his autograph! I had so many parents come up to me and even email me that this was the best event we had all topped off by Steve's performance. All in all, I would highly recomment Steve for any event or party. Check out his website for some of the illusions he can perform at a large scale venue. I would love to see them live! I know Steve does some work at area restaurants and my son cant wait to go see him again. I can't wait either! Thanks, Steve, for a wonderful experience! Wow ... what a great review! This kind of feedback makes it all worthwhile! We really enjoyed performing for such a great group! Thank you again! Thank you Steve for the performance yesterday. The children and us the adults enjoyed it so much. We had a few kids that were not following instructions and were little ‘spoilers’ but Steve is a truly professional entertainer and knows how to deal with them. Love that about him! All my pleasure, some little ones have a lot of energy ... all part of the game! Your son had a lot of questions after the show! Great performance! Kids loved it! Kids were seated in rows participating when asked, adults were standing and watching attentively with oohs and aaahs at each magic trick, laughter and applause filled the air from time to time, great show, everyone enjoyed my son's bday party and I ended up passing out Steve's contact information to many, thanks Steve for the great show! Always great to hear ... the kids were great! Thank you so much for having me perform! Great entertainer for young kids! Prompt, responsive and great entertainer for kids. Really gets the audience involved and obtains laughs from all. Thanks for making my sons 5th birthday unforgettable! The kids were great! Thanks for having me be part of your special occasion ... it was all my pleasure! Steve performed at my daughter's first communion party. Everybody was well entertained-both kids and adults. Thank you for a great show Steve! All my pleasure ... the kids were very excited! The magician was great! Kids and adults loved the magic show. Very interactive. He was very professional and on time. Great with the kids too! You can’t go wrong with hiring him for your next party!!! Great price for the services he provides too! All my pleasure ... the kids were great! Thank you so much for a great review! Magic Steve did a FANTASTIC show for my daughters birthday!! Magic Steve was great. He did a show for my two daughters' birthday party with their friends. He entertained a room of 6 and 7 years olds. He keep them engaged, surprised, and laughing the entire time. My daughters' LOVED him and can't wait to have him come again! Always great to see you and the family! We hired Chezaday Magic For a birthday party and he was beyond wonderful! The kids were beyond amazed as were the parents. The show kept moving and had no down time, the interactive participation was great! Everyone loved him! He is also phenomenal with kids and has extreme patience (9 kids aged 2-7) and 100% professional! I will definitely hire him again! Thank you!! Awesome ... thank you so much for the kind words! You’re the best! Everyone didnt expect a magician and the show was a blast...definitely gonna hire him again and i recommended him, he is great. Thank you for such a great review! The kids were great! Steve was incredibly easy to work with- go with the flow mentality. Everyone really enjoyed the two shows he did for us. He was very professional and we definitely work with him again! What a great event, I'm glad I could be part of the Boo Bash! I had a great time entertaining the guests! Very nice show.so much fun for kids and adults. We had a great time, I will recommend you to my friends for sure. Thank you for making our party super cool. Thank you so much, the kids were great! It was all my pleasure! We hired Steve to do magic for my son’s fourth birthday. We had about 20 kids ages 4-8 and they all loved the show. I found Steve very entertaining and engaging and the kids loved volunteering to come up and help during the show. I highly recommend Steve for any children’s parties. The look of joy and giggles from my son as he watched the show was priceless. Wow ... what a great review! I’m glad your son and everyone else enjoyed the show! You kept everyone entertained even the adults. In the future I will hire magic Steve again!! Thank you for the great time! Awesome ... glad I could make Alyssa's birthday special! Magic Steve did an awesome job entertaining the kids, and was funny and entertaining for the adults as well! Would highly recommend! You made me feel right at home, like I was part of the family! Thank you so much for another Five Star review! Wow ... you are the reason I do what I do! Thank you so much for letting me share of my magic with your family! What a fun day! Steve did such a wonderful job engaging and entertaining sixteen 8 year-old girls. He let them participate in the show and held their attention the whole time. It was the perfect way to end our daughter's birthday party. We would definitely use him again! Thanks, Steve! The girls were great ... it was all my pleasure! I'm glad you found me! Steve was great. He came on time, put on a great show and the kids, as well as the parents loved it! Awesome! It was all my pleasure ... the kids were great! Chezaday did a performace for my mother's 70th birthday and it was great! His show was enjoyed by both young and old. Plenty of audience participation and balloon animals for kids at the end. Highly recommend his performance and will book him again. What an Amazing evening ... I'm glad we could be part of it! I felt like I was one of the family ... it was all our pleasure to entertain your guests! Thank you so much! Great magic show and balloon making! Great price and flexible with fitting our party in a short notice! It was all my pleasure, glad I could fit your group in on a busy weekend. Steve did a great job. My son is 7 and loved the show. The kids were all mesmerized by him. Lots of audience participation, which is what my son was looking for. Hoping to go see him at Aurelio's sometime soon. Thanks Steve!! Awesome! It was all my pleasure, the kids were great and everyone was very helpful with getting my equipment in. You made my day! Steve was amazing! Easy to work with and put on a great show enjoyed by all. Can't wait to see him perform again! It was all my pleasure ... heck, I felt like part of the family! Steve Chezady is FANTASTICALLY entertaining! I was so thrilled with the show! There were kids ranging in ages 5-12, and many adults! He captivated EVERYONE! I hired Steve and Carol to perform the Cabaret Magic Show and additional Strolling Magic for my husband's surprise birthday party (my husband practices magic as a hobby). The Cabaret Show was performed by Steve with Carol's help. Together, they captured our interest, presented very cool tricks, used children in the audience and my husband as helpers and presented them with awards. The strolling magic was done at individual tables and was very interesting. Steve also made animal balloons for the children involved. Everyone was amazed at Steve's talent and would definitely recommend him and Carol for entertainment!!! It was all my pleasure to entertain your group ... heck, I felt like family! I'm glad I was able to make Kyle's 40th birthday special! My neighbor had Steve for a birthday party a few years ago and I like him so much I booked him for my sons 6th birthday. It's not just his magic it is also his personality that brought me back. Easy going and funny adds to his show. You can tell he really enjoys what he does and he gets the kids into the action. Thank you for what you do. Awesome! It was great to see you and the family again! It was all my pleasure! Steve was a wonderful find. We had 18-20 6 year olds mesmerized and captivated by Steve's Magic show at my son's birthday party at our home. He is very good with kids and very well organized. The individual balloon animals at the end were also a big hit. Thank you - Steve. Thank you so much for everything! It was all my pleasure entertaining your friends and family! You're the best! great magic show for kids! kids enjoyed the show immensely! especially great for 6-10 year olds! He put on a great show for my six-year-olds birthday party with his friends. All the kids had a blast! Thank you so much, it was all my pleasure to entertain your friends and family! Let me start by saying, that he arrived early. His set -up did not take long, he kept the children entertain the whole time. Every magic trick was spectacular. He even did the floating magic trick on my son. WOW, he did Ballon swords for each kid, he was great we will hire him again next year. And he also has an amazing partner that he recommended for face painting, she was very artistic. If your looking for a great magic show for your party i will recommend Steve the magician. Wow ... what a great review! Thank you so much, it was all my pleasure to entertain your family! Kids loved his show and so did adults. Kids loved his show and so did adults. It was economical and great fun!!! He was prompt on contacting and kept it simple, which is the best part. He was not like others who make booking and advance payments complex. It was all my pleasure to entertain your friends and family! Fantastic magician, Entertainment not only for the kids but adults too. This made our party a hit!! The kids absolutely enjoyed every minute!!! Awesome! What a great Five Star review! Thank you so much for having me entertain your group! Performed for our members and their families. everyone enjoyed show and will have back next year. Awesome ... what a great review! It was all my pleasure! Steve arrived early, set up quickly and had the kids amazed within minutes. The show was incredible. Kids ages 2-10 loved it. He also did balloons afterwards which was a huge hit. So glad we found Steve. Awesome ... I'm glad I could be part of your celebration! It was all my pleasure! Steve was amazing. He entertained the entire range of people He captured every ones attention while performing and left them in awe. He was worth every penny we spent. I would highly recommend Steve for your event. Thanks Steve for helping to make Susanna's 50th a fabulous event! It was all my pleasure ... what a great family! At one point I was on my knees on the dance floor entertaining the children ... They were awesome! We hired steve for scout event that included 50 noisy kids! He was great illusionist with a sense of humor that appealed to adults. Would hire again!! It was all my pleasure to perform for the Scouts ... I was one myself many years ago! Thanks for another Five Star review! First of all, let me start by saying, Steve's spirit was on point! From the time he entered the building until exiting. He came - He conquered! The children loved him as well as the adults. Children who wouldn't normally stay still were extremely attentive. The entertainment was fantastic with an array of fun filled, audience participation based activities. My 9 year old son along with family & friends experienced a day they will remember & cherish for a lifetime. Lord, my son went home and drove the entire family batty with all the tricks Steve gave to him, personally. Steve, you left a BIG (positive) impression on Dinum! May God continue to rest His ULTIMATE FAVOR upon your life! Be Blessed - Anne W.
Wow ... you truly brightened my day with words! It was a pleasure to entertain your family and friends! It was all my pleasure to entertain your group, thanks so much for another Five-Star review! I reserved Steve Chezaday for my son's first birthday party, which included family and friends from the ages of one to eighty! He did an amazing job entertaining all. I was complemented on my choice of entertainment all afternoon and I would highly recommend Steve for your next party. It was all my pleasure to entertain your group. Thank you another Five Star review! Great show for all ages!! The YMCA had Chezaday out for our School's Out Camp and the kids AND staff had a blast! Already looking for dates to have him back! It was a pleasure to perform for your group ... can't wait to come back! Magic Steve was just terrific! He was professional and very easy to work with. On the day of our son's 7th birthday party, everyone watching had a blast! Both kids and adults were truly amazed and it was really nice seeing all the looks on their faces and hearing ooohs and aaahs the entire time. Would definitely recommend him to anyone looking to be entertained and expecting something truly "magical"! Thank you so much for another "Five Star" review! It was my pleasure to entertain your guests this past weekend. Steve came out to my house for my 40th birthday party. He did a walking show at each table for all the guests and made balloons for the kids. Prior to the event, we communicated back and forth. At the party he was timely, polite, funny, accommodating and adjusted to the flow of the party. He was a huge asset to the party, plus, the price was right. I got many compliments on his show and afterward the adults sat around trying to figure out how he did it all!!! But I don't really want to know, that would spoil the fun of Magic. It was a pleasure to work for your family ... thank you so much for another Five Star review! Steve was amazing. I had a rowdy grouping of 7-8yr old boys and they loved the show! He kept them intrigued and entertained for the duration of the show. I can't wait to plan my next kids party so we can bring Steve back again! Thanks so much for such a great party! Always great to hear ... thank you for a wonderful review! I'm so glad I booked with Chezaday he was awesome!! He had a smile on his face at all times. Both Children and Adults loved him!! He made my girls Golden birthday party fun!! That's awesome ... thanks so much for the great compliments! It was a pleasure to perform for your family and friends! So much fun to have Steve at the house to entertain an all ages show! He had so many fun tricks that both young and old liked. He was kind and courtesy. I thought his fee was great for what he did. I highly recommend the show. It was all my pleasure! What a great group of girls ... and so polite! Steve performed at my daughter's 7th Birthday party. He did an amazing job! The kids and adults were glued to him the entire time and he had everyone cheering and laughing. I would highly recommend Steve. I would hire again. Also, the balloon animals was a hit! He truly did an amazing job. I couldn't have asked for better. :) Thank you, Steve! Wow ... another Amazing review. The kids were great and well-behaved ... a pleasure to entertain! Thank you so much! Steve was great fun at my daughter's 4th birthday party. He was very professional with timely and clear communications. Extremely easy and pleasant tow work with. Highly recommend! Steve Chezaday worked with us to provide a fun, magical and educational magic show for a Family Math Night. The evening was filled with everyday mathematics and problem solving intrigue for the whole family! Thank you so much for such a great review! It was my pleasure to entertain the students at last nights event! Steve was hired to entertain my daughters 18 friends at her 7th birthday party. He was perfect, kept them involved, funny, and the magic show was fantastic! The kids were great ... a pleasure to entertain your friends and family! We hired Mr. Chezaday for my daughter's first birthday party. It was so worth it ! His show was great and he had everyone entertained. We went with strolling magic during appetizers along with face painting for the kids. Then the two-person illusion show with levitation illusion as the finale after dinner. It was just GREAT. The party had just over 100 guests with 30 of those being kids, ages from 5-15. Again everyone was loving the show. Steve was great with communication about the event and day of timeline. He was prompt and professional the day of the event. I would definitely hire him again. Another Five Star review ... it was a pleasure to entertain your friends and family! Steve Chezaday came recommended to me from a neighbor. We hired him to perform at our daughters' birthday. The kids AND adults were equally entertained. Steve communicated frequently and promptly via email and showed up early the day of the event. He was very professional. I would highly recommend. Hired Steve for my daughters 4th birthday party. The kids loved him, and he threw in some adult jokes as well that kept us all laughing. Everyone really enjoyed his show and I highly recommend him to all ages! A few friends told me that they are interested in hiring him now as well! Wow ... what a great review! It was a pleasure to entertain your family and friends! What's more amazing the price? The act? Or the professionalism of the performer? The real trick would be to decide, this gentleman is all around amazing. Adults or children he's entertaining. Great show thank you. Highly recommend! It was my pleasure to entertain your family and friends ... I felt right at home! We hired Steve for our son's first communion party and he was a hit. Kids of all ages enjoyed his show. All the tricks were age appropriate and Steve himself was very professional. We all wished the show was longer even though it was a 40 minutes performance. We highly recommend him to anyone looking for great entertainment. We just had Steve this past weekend for my sons fifth birthday party. There was a group of about 11 kids ranging in ages 3-8 and 12 adults. He kept all the children engaged and entertained for the entire 40 minute performance! All of the adults enjoyed the performance as well, the tricks were very age appropriate but were complex enough to have the adults amazed as much as the kids. This experience was wonderful, and very affordable, I would highly recommend Steve to anyone looking for a magician. What a great review ... it was a pleasure to perform for your family and friends! Chezaday arrived on time and did not need much room to perform. I'm not sure how he did it but he was able to politely capture and engage his audience of (20+ ) 2-10 year olds. He was nice to the children and held their attention. I think he practices stand up during his spare time because he kept us laughing. Chezaday is very professional and dependable. At the end of the show chezaday made balloons for the kids; so, I must give a special thank you to chezaday for making sure all the children had balloons before he left. The party was a success thanks to chezaday's performance. I'm still working on my stand-up routine ... thanks for another great review! Steve worked his craft to magically entrance seven, eight years old boys into all wanting to be magicians. We hired Steve to work with our Cub Scout den to help them earn some electives. He was great on all facets of communications. He taught the boys how to do simple magic tricks that will amaze their friends and teachers. I had many parents call me and thank me for finding Steve. Their kids were so excited to learn how to do magic. My son said it was the best meeting EVER! When I was researching local magicians I was really flying blind and took a leap of faith that this would be ok. Steve was very accommodating, professional and dynamic in front of the group. I liked him so much and had such positive feedback I hired him again for my Girl Scout troop (13-fourth graders) and had the same experience. It was a pleasure to share my magic with the Scouts ... that's how it all began for me! Thank you for a great review! Chezaday was fantastic. He kept all the kids engaged and performed a good show. he did balloon animals for all the kids, showed up when he said he would and ended on time. I would hire again. We hired Steve to come to our Halloween night at the YMCA and do a show. What a show! It was great! He was wonderful with the kids, very interactive and very entertaining! It was a pleasure to entertain all the little monsters and zombies! We booked Steve's Deluxe Magic Show for our annual Halloween party this year. Steve and his assistant did an outstanding job! Steve was tasked with entertaining a group of approximately 20 children ranging in age from 3 -16 years old (quite a few adults enjoyed the show as well!). He did an amazing job of keeping the group's attention and involving them amidst many party distractions that were out of his control. He asked for many volunteers throughout the show. Every time he asked, every hand in the group was up! He adapted his illusions to reach the youngest members of our group, as well as the older children/adults. Steve's showmanship was GREAT! He is an expert magician with a variety of tricks up his sleeve. Steve and his assistant were very professional and we loved the way they connected with our group. Steve's communication with me from the moment I reached out to learn more about his services was and continues to be outstanding! He provided me with all the details I needed and anytime I reached out to him via email or phone he got back to me very quickly. I strongly recommend Steve Chezaday's Magic Show for your next party/get together! Steve is a true professional and is a pleasure to work with. Another amazing review ... it was a pleasure to entertain your friends and family! Magic Steve was very accomodating. We had him at our twins 7th birthday and he saved the day! The kids loved him. He involved the kids in his show and held their attention for 40mins. Would highly recommend him. The kids were great ... made me feel like a Rock Star! It was a pleasure to entertain your family and friends! We were looking for a magician last minute. I received Chezaday's name from another magician. He called me back immediately, and was able to fit us in! The kids loved him, he was funny and even left some of the parents wondering how did he do that?!?!? I would recommend him and use him again at my next function! Another great review ... I'm glad I could fit your party in my schedule! Steve performed at my daughter's 9thr birthday party. He did a wonderful job and all of the kids had a wonderful time! Chezaday did an outstanding job!! We had Chezaday out for our son's 10th birthday!! Our son loved the show more than when Chezaday came for his birthday the year before. Everyone of all ages enjoyed Chezaday. All five of my kids loved him and want him to come foe their birthday too. Great entertainment. Fun for everyone. I hired Steve to perform at our neighborhood's block party. He did a great job of entertaining the kids who spanned a wide range of ages and had all of the adults trying to figure out the tricks. Working with Steve was really easy. I just told him where, when and who he was going to be performing for and he took it from there. I will definitely hire him again for future events. Magic Steve was the highlight of our 7 year old daughter's birthday party. Our daughter has an interest in magic, but we were not sure how the other 10 kids would react. And like magic...all eyes were glued on the show, for the whole 45 minutes! Even the two 4 year olds at the party loved it! They couldn't get enough of it. Magic Steve was great with the kids, engaging and friendly. Forget the bounce town, water slide, and clowns - hire magic Steve for a party! How cool is that ... thanks for such a great review! It was a pleasure to make your daughters party special! Steve was a fun, entertaining and interactive magician. He has something for all ages. I would hire him again for another event in the future. I had just as much fun performing for your family ... thank you for such a great review! Steve is a genuine guy! 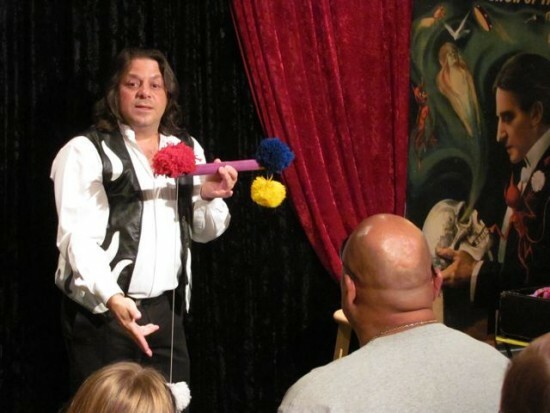 Kids loved his show, adults thoroughly enjoyed his illusions. Very entertaining and well worth the money. Wow ... doesn't get much better than this! We hired Steve for a joint family birthday party. We had children ranging from 3 years old to 12 years old, and they were all entertained-even the adults! He did a wonderful job, and there was plenty of audience participation too! It was a great show and every person at the party loved it. Highly recommended!! Chezaday did a great job at my parents wedding anniversary. The kids were kept entertained. The adults laughed out loud. Verry professional. Showed up early and was well equipt. The rates are verry reasonable. "Magic Steve" was the perfect addition to our celebration. His adapts his show to be audience appropriate. We had a age group from 3 years to adults and all in between. Everyone was entertained. My family and friends were very entertained. I highly recommend Chezaday Magic for any occasion. It was a pleasure to perform for your family and friends ... always great to hear that everyone enjoyed the show! We had Steve perform for our daughter's 5th birthday party. All kids ranging in ages enjoyed it and were very captivated for the duration of the show. It was a pleasure to work for your family! Looks like I'll have to work on my expertise! Kids (and adults) had a great time! My 8 year old requested to have Magic Steve at her birthday party after seeing him perform at a local pizza restaurant a handful of times. The boys and girls enjoyed the show and loved being a part of the act. The adults thought the illusions were pretty amazing too! Afterward he personally talked to each child while twisting balloons for each one. The kids had a great time! Chezaday, you really made our day! The kids had a lot of fun as well as the adults! Very professional and precise, the show is amazing, my kids already asked me to have you performing again on the next party, so.... get ready!!!! Another perfect score ... thank you! It was a pleasure working for your family ... I felt right at home! We hired Steve the magician for our son’s communion party. Overall the show was very nice. During the 40 minutes, Steve had some interactive magic tricks with the kids. He amazed all of them with his incredible illusions. The kids had so much fun participating. He made my son fill very special by using him for his last trick and made him “Float on Thin-Air “ after the show Steve also made a Balloon animals and swords for all of the children. It was a pleasure to work for you ... the children were very well behaved! Great Performance for all ages! We had the Chezaday Magic Show for my sons 6th birthday party and it was awesome! The kids absolutely loved it and it was even funny for the adults too! My son has already asked if we can have the same magic show next year for his birthday! I recommend going all out with the levitation at the end for the guest of honor - my son thought it was the coolest! Also, all the kids got balloon creations afterwards which they loved. Steve was pleasant, funny, prompt, reasonable and definately entertaining! Over all great job! Always great to hear ... I'm glad everyone enjoyed the show! We recently used Chesaday Magic for a recent Volunteer Recognition event where he and an assistant wandered from table to table offering magic tricks, followed by a few additional tricks on stage for the whole group at once. Our guests loved the show, and they were a huge hit! Steve was wonderful to work with, and very accomodating of requests made to him. I highly recommend him! It was a pleasure working for your group ... thank you again, it was a "magical" night! My son had Chezaday come for his 6 year birthday party. The kids loved him. They really enjoyed the magic show and then the balloons he made for them afterwards. The price was reasonable and he came to our home. It was easy to book him and he set up and took it down quickly. I would recommend him for a child's birthday party. Steve has performed twice for us for our son's birthday parties. He did an excellent job keeping the kids entertained. What a great review from a wonderful family! Thank you again! Always great to hear ... I enjoyed entertaining your group! I think the event was a great success! ABOVE AND BEYOND ANY HIGH EXPECTATIONS! We had Steve for my son b-day party 2 years ago.I did not know what to expect finding him on this website,no real person refferal.I was afraid the kids may not like it or may not be appropiate or he will have too easy tricks you can find in a kit.BY FAR,this was the BEST EXPERIENCE we ever had!The kids had a blast(they were first grade back then).Since that party,my 2 kids recalled it several times seemming to be UNFORGETABLE!This year I decided I will have Steve again just for the family (my son wanted a lasertag party for the whole class).Even they still remembered the tricks was a wonderful surprise and been told that I am the best mom in the world bringing this magician back!They really enjoyed and the love the way Steve is:serios,calm,but very funny and close to them. Steve,we thank you SO VERY MUCH for everything and if you put together a new show we would love to have you again in October for Sarah's party! How cool is that ... thank you for the kind words! It's always a pleasure to perform for families that truly appreciate my show. I look forward to entertaining your family and friends in the future! We saw this magician at a local park festival. He has a wonderful show that is genuinely entertaining for all ages. He has a gentle and witty sense of humor, which I was particularly grateful to find, as I think it's very rare to find performances these days that are truly family friendly. The magic was awesome, especially since he used so many volunteers from the audience. We're hoping to hire him for our son's birthday party in October. 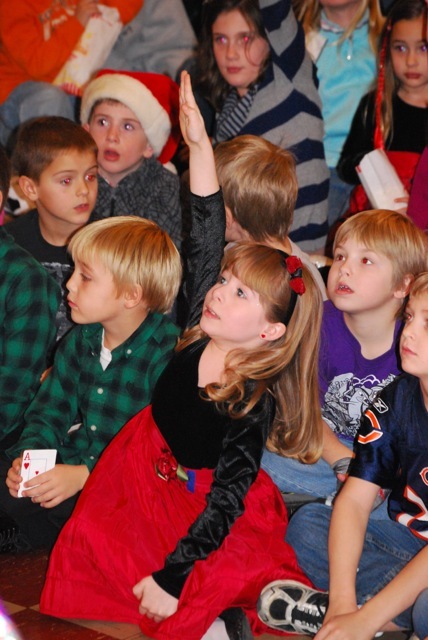 We hired Chezaday to perform at our son's birthday party in Naperville and his magic show was the hit of the party! He held the attention of a roomful of kids under 10 and that in itself is amazing let alone the magic that he did which fooled all the adults as well. My son is still talking about Chezaday and watches the video at least twice a week. We highly recommend his magic and illusion show! For over three decades, Steve Chezaday has thrilled spectators of all ages with magic that challenges the imagination. With his energetic style, Chezaday strives to create new and innovative illusions to captivate his audience. Through sold-out performances across the country and numerous television appearances, Chezaday has truly become a rising star in the world of magic!